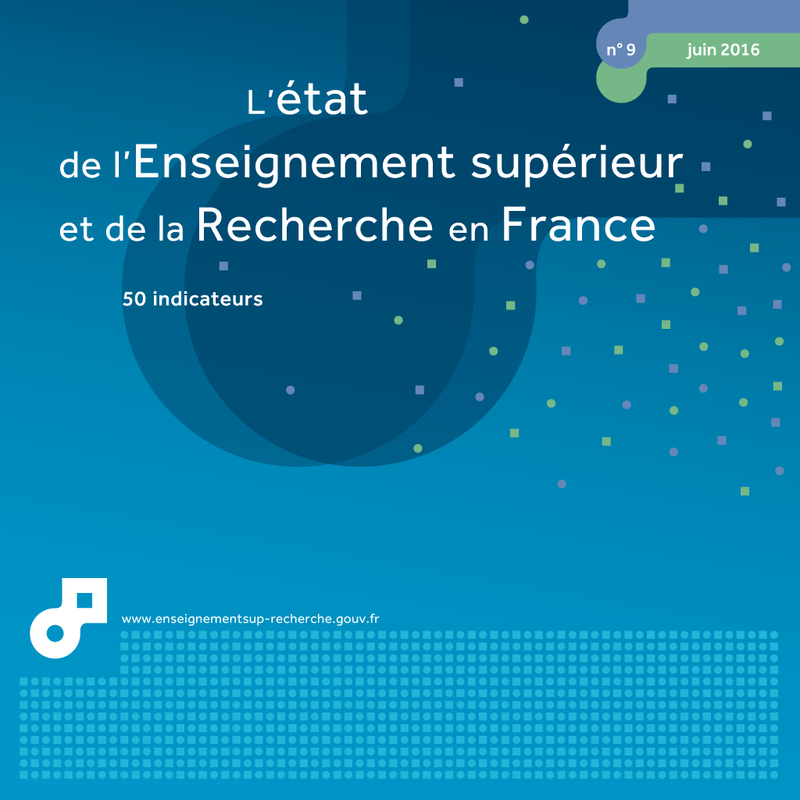 The data published here cover the scope of higher education as fully as possible, with the exception of work-study programmes and apprenticeships, unless these are run by a university (for more information, please refer to points 6.1 and 6.2 in the 2015 edition of Repères et références statistiques). The variation in numbers of students between the two academic years may be due to changes in the population of studying age ("demographic factor") or a fluctuation in the appeal of higher education ("educational factor"). Enrolment rates by age are the ratio of the number of young people of a given age in higher education, against the estimated number of the population of the same age. By applying the rates recorded for the 2009-10 academic year to the 2014 population, we get a theoretical number of students for the 2014-15 academic year. The "educational factor" is the difference between this number and the number of students who actually enrolled in 2014. A positive "educational factor" demonstrates the increase in the proportion of young people in a generation who enter higher education. This increase can be due to two, possibly combined phenomena: more young people obtain the Baccalaureate, or a growing proportion of new Baccalaureate holders enter higher education. The "demographic factor" is the difference between the development in the number of students between the 2009-10 and 2014-15 academic years and this "educational factor". With 2,470,000 students enrolled at the start of the 2014-15 academic year, numbers in higher education have increased significantly (+1.6%). There have never been so many students. This rise is due to the growth in the proportion of young people accessing higher education, even though the number of young people has fallen. In 2014-15, 2,470,000 students enrolled in higher education in mainland France and the overseas departments. The number of students enrolled increased for the sixth consecutive year (+1.6%, i.e. 38,400 students more than in 2013): there have never been so many students in France. In five years, 157,000 additional students have entered higher education (+7% between 2009 and 2014). Growth was three times less during the five previous years with 44,000 additional students between 2004 and 2009 (chart 12.01). Changes in the size of generations should have led to a 100,000 drop in the number of young people enrolled in 2014-15 compared to 2009-10 (table 12.02). The increase in numbers is not therefore due to a "demographic effect" but a massive "educational effect" since 2009, although it was much more modest in the five previous years (see methodology section opposite). In 2014-15, 1,531,300 students enrolled in universities in mainland France and overseas departments, which represents 62% of all enrolments in higher education, including 5% in preparation for the university diploma in technology (DUT). Numbers at university increased by 7.5% in 10 years (table 12.03). The increase in preparations for the DUT was 3.6% in ten years. The main areas of growth were therefore on other university courses, especially during the last two years. The situation per discipline is highly contrasting. In Law and even more in Healthcare, numbers increased very significantly between 2004 and 2009, and the increase continued at a more moderate rate over the next 5 years. In Economics, Economic and Social Administration (AES), growth was 4.2% over the decade, and nearly zero over the last 5 years. Finally, the recent upturn in university numbers is noticeable in the "Arts, Humanities, Languages, Human and Social Sciences" group, and especially "Sciences, Physical Education and Sports Sciences and Techniques (STAPS)", whose numbers fell between 2004 and 2009 and increased between 2009 and 2014. One student in six, i.e. 437,700 students, attends a private educational institution (chapter 09). Numbers have been virtually stable for two years, but have significantly increased since 2000. Although in total 55.2% of students are women, their proportion varies according to the courses. There is a large majority of women in Humanities and Human Sciences (70.1%) and on paramedical or social work courses (83.9%), but they are in the minority on more selective courses (CPGE, IUT) and, above all, on scientific courses, only representing 27.2% of engineering students (chart 12.04). 126,500 advanced technician diplomas (BTS) were awarded in 2013 (chart 12.05), a rise of 25% in 10 years. 46,300 university technology diplomas (DUT) were awarded the same year, 4% less than ten years previously. Between 2003 and 2013, the number of vocational Bachelor's degrees awarded (47,300 in 2013) multiplied by 3.7, while the number of general Bachelor's degrees fell by 6%. 121,300 Masters and 13,700 Doctorates were awarded in 2013, numbers that have grown considerably since 2003, but have stabilised in recent years. Furthermore, 31,600 engineering degrees were awarded in the 2013 session, an increase of 20% in ten years. Business and management schools awarded 34,400 degrees (excluding continuous education and apprenticeships), a figure that has increased significantly over ten years (+41%). Extract from the chapter "12. students in higher education". The total number of students in higher education increased by 156,600 at the start of the 2014-15 academic year, compared to the start of the 2009-10 academic year. Without the effect of other factors, the changes in the size of generations (demographic factor) would have resulted in 103,500 fewer students enrolling. 1 Scopes defined in RERS points 6.1 and 6.2. 2 including engineering courses dependent on universities, national polytechnical institutes (INP), technology universities and engineering courses delivered in partnerships. In 2015-2016, over 2,550,000 students were enrolled in higher education in France. The number of students has grown without interruption for seven years. The rise concerns all sectors this year, but in varying degrees. Enrolments at university are still predominant. Nearly one student in five is enrolled at a private institution. In one year, enrolments have increased in all the regions of France, except for Corsica. In 2015-2016, 146,447 students were enrolled on engineering courses (excluding engineering courses in partnership with universities), an increase of 4.0% compared to 2014-2015. The rise was particularly marked in private institutions (+6.2%). Seven in ten students are trained in public institutions, i.e. under the authority of the Ministry of National Education, Higher Education and Research (MENESR) (82,000 students), or under the authority of other ministries (20,000 students). Three in ten students attend private institutions (+6.2%). In 2014-2015, around 141,000 students were preparing for a State-recognised engineering degree, accredited by the Ministry of National Education, Higher Education and Research (MENESR). Around 33,000 degrees were awarded in 2014, an increase of 22% in ten years. The engineering degree is awarded following five years of study after the baccalauréat, the last three as part of an engineering cycle. The trajectories are varied: half of entrants to the first year of an engineering cycle come from CPGE (classes preparing for admission to Grandes Ecoles) and 21% from an integrated preparatory cycle. Parallel access routes help to diversify the recruitment of entrants to an engineering cycle: 13% hold a DUT (university technology diploma) and 7% hold a Higher technical certificate (BTS) or Bachelor's degree. Although representing nearly half of scientific baccalauréat holders, only 29% of engineering students are women. Some universities and engineering schools offer LMD Master's programmes (Bachelor's-Master's-PhD) in engineering which can lead to employment in the engineering sector. In 2014, 6,300 students on these Master's programmes obtained their qualification. In 2015-2016, the number of students enrolled at university was 1,593,300 (+4.0% on 2014-15). Excluding dual enrolments in classes preparing for admission to Grandes Ecoles ('excluding CPGE'), the increase was +2.4% (+35,500 enrolments). Student numbers showed contrasting trends according to the subject area, similar to the previous year. In 2015-16, there was a continued strong dynamic towards Sciences (+4.3% excluding CPGE), and Arts, Humanities, Languages (SHS) (+3.7% excluding CPGE). By contrast, numbers changed little in Law and Economics-Management compared to the previous year. There are various trajectories open to students who wish to study economics or management. After obtaining the baccalauréat, or after two years of classes preparing for admission to Grandes Ecoles (CPGE), they can enrol at a university, University technology institute (IUT) or a business school. Universities, which this study focuses on, offer courses in Management, Economics, Economic and Social Administration (AES) and eco-management multi-sciences. This variety results in different course content and prospects. For these different courses, the main access route is still the Economic and Social Sciences baccalauréat. Courses in AES, which is more generalist and multi-disciplinary, appeal to a great diversity of profiles, in particular technological and vocational baccalauréat holders, whereas the Economics route, which has a more theoretical content, attracts scientific baccalauréat holders. In the end, depending on the course, between 30% and 50% of students obtain their Bachelor's degree in 3 or 4 years. Nearly one-third of Bachelor's graduates continue onto a Master's programme. Depending on the course, 46% to 61% of Master's students complete their studies in 2 years. At the start of the 2015-16 academic year, the number of students enrolling in Advanced technician's sections (STS) was slightly up, and now exceeds 256,000 students in initial education (excluding apprenticeships). Institutions under the authority of the Ministry of National Education, Higher Education and Research (MENESR) account for 90% of students on these programmes. The majority of new entrants to these sections hold technological baccalauréats. There have never been so many students in higher education in metropolitan France and the Overseas departments and territories: 2,470,700 at the start of the 2014-15 academic year. Numbers continue to increase (+1.6% in one year, or over 38,400 additional students), in particular at university (+2.1% in one year). In five years, higher education has welcomed over 150,000 new students (+7%). Engineering schools have seen a particularly high rise in numbers. By contrast, the number of students in State-recognised business schools has stabilised, following years of marked increases. The numbers enrolling in classes preparing for admission to Grandes Ecoles (CPGE) has risen moderately (+0.8%). On short courses (University technology institutes (IUT) and Advanced technician's sections (STS)), numbers have been stable. At the start of the 2014-15 academic year, all the local education academies apart from two saw an increase in students. Just over one student in six was enrolled in a private education institution. Female students continued to be in the majority. One in eight students were foreign nationals. In 2014-15, 1,531,300 students were enrolled in French universities, compared to 1,499,600 in 2013-14, an increse of 2.1%, slightly less than the previous year (+2.5%). In particular, there were more students on Bachelor's degree programmes (+2.2%) and Master's programmes (+2.3%), but the number of PhD students was lower (-1.7%). There was a dynamic increase in enrolments of new baccalauréat holders at university (+2.9%), although this increase was partly due to parallel enrolments in classes preparing for admission to Grandes Ecoles (CPGE). There was a very dynamic increase in enrolments on Scientific courses and Humanities and Social Sciences courses. The number of new technological baccalauréat holders increased significantly in University technology institutes (IUT) (+7.0%). The proportion of foreign students at university fell slightly to 14.3%, as did the number of foreign students not holding a French baccalauréat (11.0%). The proportion of foreign students on PhD programmes remained stable, at 41.5%.